GRIFFIN Bead Silk Cord BLUE, 2 meters. 100% Natural Silk. Needle is attached to one end of the ..
GRIFFIN Bead Silk Cord BLUE, 2 meters, 07 size large. 100% Natural Silk. Needle is attached to ..
GRIFFIN Bead Silk Cord BLUE, 2 meters, size 08. 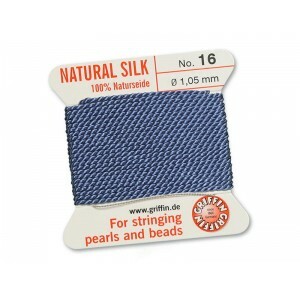 100% Natural Silk. Needle is attached to one en..
GRIFFIN Bead Silk Cord BLUE, 2 meters, size 10. 100% Natural Silk. Needle is attached to one en..